At every instance of unnecessary and callous city destruction, every inset of comic flatulence, and every mention of what I sincerely hate to denote as turtle boners, I found myself resenting this latest cinematic stab at Teenage Mutant Ninja Turtles. 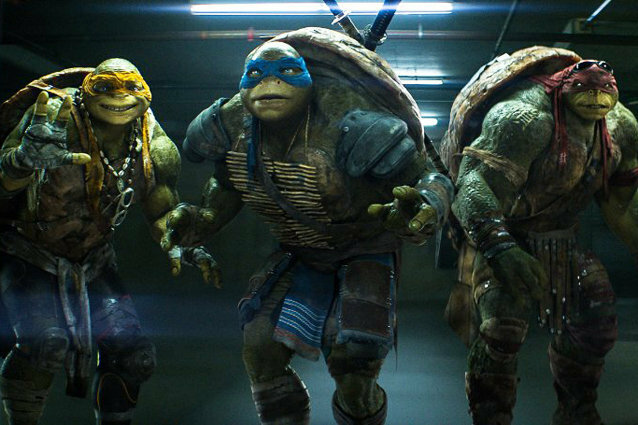 A movie that makes so little effort to stray from the lowest common denominator of what passes for PG-13 entertainment, the Michael Bay-produced Turtles is far less concerned with what it is doing than with the fact that it is simply doing something. Anything. At all times. Martial arts, car chases, flashbacks to lab fires… it’s all a go. The funny thing is that Turtles’ egregious flash does, at times, manage to cover up its vacancy. When the familiar, albeit modernized, foursome — street tough Raphael, eager intellectual Donatello, giddy halfwit Michelangelo, and the borderline anonymous Leonardo — are goofing around under the tutelage of serious sensei Splinter, there are occasional smiles (not laughs, let’s not get crazy) to be earned. And, ridiculous as it all may be, when the quartet of reptilian vigilantes zooms down a snowy mountain (don’t ask me how they get there so quickly from springtime Manhattan) in hot pursuit of (or evasion of… man this thing is incomprehensible) a band of evil mastermind Shredder’s toughest assassins, we witness the miraculous achievement of genuine fun. But for every minute enjoyed with the turtles, there’s about five lamented with Megan Fox. Her April O’Neil is meant not only to courier us through the action and outrageous origin mythology — which, justly, we get out of the way pretty early in the film — but to serve as the human heart with which we access and understand these bonkers creatures. But April is the most alien character onscreen, effectively mindless and charmless, truly beyond the grasp of any viewer looking to latch onto her as a remotely fleshed out heroine. Alongside Will Arnett, whose sole function in this film is that he has a car, Fox runs us through the legion of non sequitur elements that stands in for a cohesive plot. Occasionally, she stops to chat with the turtles, who — for all their irritating characteristics and regrettable attitudes on romance, masculinity, and pizza (they love Pizza Hut… these jags live in New York f**king City and all they eat is Pizza Hut) — actually revel in relative nuance. Their second-rate charms never manage to effectively save the movie from its ultimate crime: it’s so, so stupid.